If you’ve come to study in Spain but you have Celiac disease or are gluten intolerant, you’re probably worried about eating gluten-free in Spain. You don’t have to worry, just be prepared! You will see lots of “sin gluten” labels in the grocery stores. There are also plenty of amazing Spanish dishes (even some tapas) that you can enjoy. To help you prepare, we’ve made a list of the easiest dishes to order for people eating gluten-free in Spain. Don’t forget to order a Spanish drink with your meal, either; Spanish wines, sangria, and the delicious Agua de Valencia cocktail are all gluten-free. Tortilla de Patatas – The Spanish potato and onion omelette is a staple of the Spanish diet. There may be slices of bread offered alongside the tortilla. If you’re eating gluten-free in Spain, you can ask if they have a gluten-free replacement or bring a gluten-free loaf with you. This is a great tip for eating pinchos as well, which are tiny snack sandwiches on baguette slices. 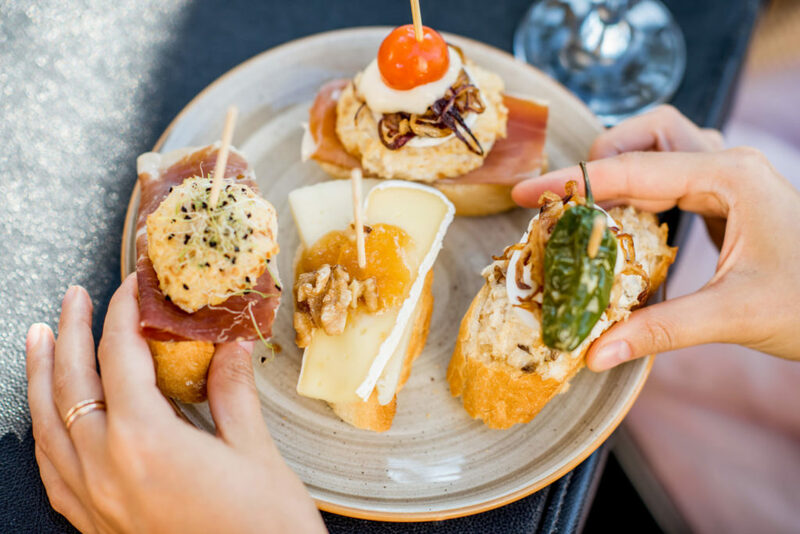 Pinchos are an amazing snack, but you’ll have to bring our own gluten-free bread. Jamón Serrano/Ibérico – This is arguably the most famous ham (and can be the most expensive) in the world. Lucky for you, it’s also gluten free! There are many varieties of dry-cured ham in Spain and you’ll be able to taste test them all. Be wary of other lunch meats or sausages such as chorizo, which can have flour added. Vegetarian or Valencian Paella – The national dish of Spain is rice-based, so it’s safe to try! However, in some places it can be prepared with bouillon cubes that contain gluten, so always double-check. Pulpo a la Gallega – You should definitely try this boiled octopus dish from Galicia. It’s topped only with pure olive oil and paprika, a simple yet classic Spanish dish. Manchego cheese – You can eat the most famous Spanish cheese! Unless it’s been heavily processed, cheese in Spain is normally gluten-free. Crema Catalana – The traditional Spanish dessert is made from cream, eggs, and sugar. It’s important to ask if it’s homemade, or casera, because mass-produced versions may contain flour. Don’t miss out on the nightlife! 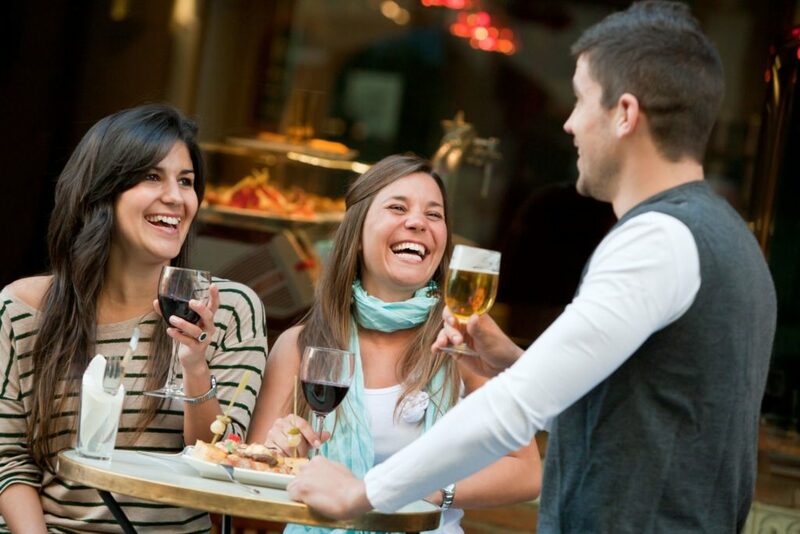 Relax with a gluten-free Spanish wine. Unfortunately, there are some things you’ll just have to avoid if you’re staying gluten free in Spain. For example, it’s best to avoid ordering anything fried, whether you’re in a tapas bar in Madrid, Barcelona or Valencia. The oil in restaurants is often shared to make food with gluten. Instead of fried cuts of meat or seafood, ask for it to be prepared “a la plancha” instead. That means your Spanish food will be grilled! This is a great gluten-free hack, although you should still beware of processed meat like hamburger, sausages and meatballs, which often contain breadcrumbs. Lastly, if you don’t plan on attending a Spanish language school in Spain, you may need some help with the language. Not everyone speaks English here! If you are serious about eating gluten-free in Spain, it may help to buy a gluten-free card to show to waiters in Spanish or Catalan.